Dimensions: Dining Chair- 23 Wide, 24 Deep, 35 High. (25 Arm Height) Dining Table- 48 Round, 29 High. Essentials Dining Set of 5 -Noir Finish with Glass Top Table. 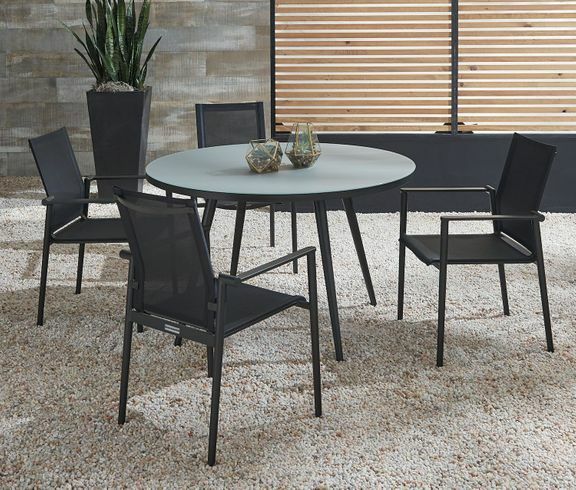 The Essentials dining set of 5 includes 4 aluminum framed chairs with sling backs and seats for quick drying and 1 round dining table with tempered a milky and opaque look. Table has an umbrella hole that can be covered if you do not need an Umbrella in your area. Dining Chair- 23 Wide, 24 Deep, 35 High. (25 Arm Height) Dining Table- 48 Round, 29 High.